So kids, are you ready for one of those strange treats from Nobody Records? 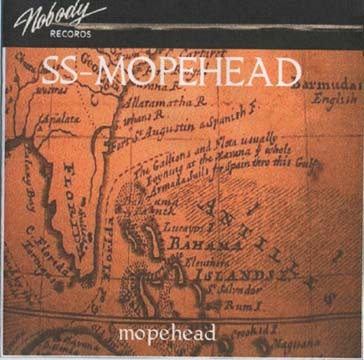 Well, ready or not here's a track from mopehead's SS-MOPEHEAD CD called "My Boat". From the land of Yarn comes the tale of Captain Sinkwright, Sleepy Pete Ocean Sheep, and the Fish. 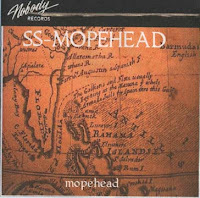 SS-MOPEHEAD (a 14 song CD) tells of the Captain's relentless search for the Fish and of his love for the Ocean Sheep. Check out the SS-MOPEHEAD and Fly High with Nobody Records! SS-MOPEHEAD was a strange concept CD that I put together. The tracks were recorded without the concept in mind, but soon it was apparent that the songs seemed to be connected in some strange way. I come from a seafaring family - my Dad was a Navy Captain in WWII and was in charge of a mine sweeper that kept our East Coast harbors clear of mines. I have always had a love of the sea and of water. My Dad would take me to fleet week to check out carriers and war ships and since he was a retired Naval officer we would get in to see all sorts of things the general public doesn't get to see. He would take me out on boats as often as he could so I spent time at sea, on lakes and going down rivers. I nearly drown a few times (in the family pool as a child) and I think the water in my lungs (and the fact that the human male at maturity is about 60 percent water) has given me a closeness to water and the sea. SS-MOPEHEAD is somewhat of a novelty CD (partly a kids CD and partly scary...so beware), but folks have seemed to like it. So...I warn you, it is silly and definately lo-fi. My buddy Jay liked it so much he made Flash cartoons for some of the tracks. Check them out here. From Jay's site (here)..."Captain Sinkwright is at the Port of Yarn loading up his boat getting ready for a voyage in search of Sleepy Pete Ocean Sheep. They meet The Fish along the way, The Monkey and his friends come along to help out. Plenty of danger for all. 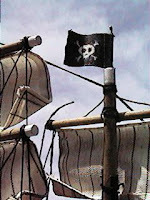 If you like pirates, boats, ships, sea creatures and cheese, we've got 'em. Click images above to start Flash animation, and sail off on the S.S.Mopehead for a very strange adventure out on the open sea." If you want to enjoy the strangeness that is the SS-MOPEHEAD check out the videos that Jay created. (Click HERE NOW). As I've said numerous times, all of my CDs are available for purchase at NobodyRecords.com. NOW GET OUT TO SEA! You've been warned.